KIWI carpet cleaning was dreamt up 30 years ago by Angela, who wanted an affordable carpet cleaning plan that could keep her home beautiful all-year round. As a mother of three with pets, spills, mud, and more, she needed a carpet cleaner that could keep up with her busy household. She found that none of the carpet cleaning companies offered such service, so she decided to create her own. Angela created a carpet cleaning company to rival all others, inventing the KIWI Lover One-Year Carpet Cleaning Service for people with needs like her own. She created the warranty to allow customers to purchase unlimited carpet cleanings at just $4 per room for an entire year. Years later, our warranty customers still love their $4 per room carpet cleanings. Our company’s first location opened in Dallas, Texas in 1987, where KIWI worked to bring about a carpet cleaning revolution. The idea of year-round carpet cleaning caught on, and customers liked it so much that we have grown beyond our humble beginnings in Dallas. We’ve expanded to major markets such as the Houston and Austin metro areas, including their surrounding cities. We also opened locations in and around Atlanta, Georgia; Phoenix, Arizona and Denver, Colorado too. KIWI is now the famous carpet cleaning company that offers discounted return visits all year long! Thousands of homeowners have enjoyed the advantages of our carpet cleaning warranty and love their beautiful, clean carpets all year. Our competitors often said we couldn’t do it, that our warranty was crazy, and that we’d go out of business trying to provide such unmatched service. Luckily for us and our customers, they were wrong! What’s With the Green hair? We get this question a lot. Inspired by our green carpet cleaning solution and by customers’ gracious compliments, we’ve taken their praise and we’ve gone green! The KIWI hair craze is a fun take on customer feedback, and it captures the good nature and spirit of our company. We step outside the norm to bring you great value on excellent services and we love what we do. 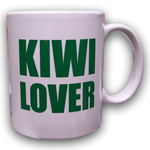 Our team is so energetic, we even have our own KIWI Lover coffee mugs! Other carpet cleaning companies are green with envy over KIWI’s discounted warranty visits that let you have clean carpets all year long. The KIWI Lover One-Year Carpet Cleaning Warranty allows you the freedom to clean whenever you want without having to pay full price each visit. Find out more about the carpet cleaning warranty and how it can extend the life the your carpet. It’s hard enough keeping a clean home without having to worry about how different cleaning chemicals affect your family. We won’t always be aware of allergies that you, your family, or friends may experience. That’s why our company has developed a green carpet cleaner that’s non-allergenic and certified by the FDA. We promise : our style of cleaning won’t just take allergens from the floor and put them back into the air. Your family’s health and safety is always a priority with KIWI. A 30-Day 100% Clean Carpet Guarantee. A one-year carpet cleaning warranty. A quick-drying carpet cleaning method. An eco-friendly, green carpet cleaning.